Native to the Rio Orinoco and Amazon basins in Colombia, Venezuela, Peru, Bolivia and Brazil. Introduced populations are thriving in various parts of the world, mainly in Far Eastern countries such as China and Taiwan where it’s farmed for eating. Inhabits main river channels and flood plains, moving into flooded forests during the rainy season. It tends to prefer shallow, slow-moving areas with overhanging or floating vegetation. Juveniles spend the first few months of life in the flood plains, where food is plentiful and predation is less of a danger. The biggest wild fish recorded measured 35.2″ (88cm). Captive specimens tend to be a bit smaller than this, but expect it to reach at least 24″ (60cm). Sadly adults are all too often seen living in cramped conditions. If you want to house one of these for life you’re going to need an enormous tank measuring at least 120″ x 36″ x 36 (300cm x 90cm x 90cm) – 2550 litres, preferably larger. Youngsters can be grown on in smaller tanks but will grow quickly when well-fed. The size of the tank and filtration used are much more important than the choice of decor. Strictly speaking, decor isn’t necessary for a tank containing an adult as it’s a very active species. At any rate try not to clutter up the tank space too much. There’s also little point adding plants as they’ll be eaten immediately. Opt for a few water-worn boulders and perhaps some large chunks of driftwood or beech branches. Ensure that any such furnishings are too heavy to be moved around or secured to the tank in some way. A large and efficient biological filter is needed to cope with the amounts of waste produced by a fish of this size. If possible choose a sump–type arrangement, as this allows most of the equipment to be located outside the tank. A large specimen can easily destroy glass heaterstats, thermometers etc. as it charges around. Otherwise, buy the biggest filter you can afford (pond filters are worth considering) and perform regular large water changes. pH: It's an adaptable species provided extremes are avoided. Somewhere within the range 4.8 to 7.5 is ok.
Stomach analyses of wild specimens show it to be primarily a herbivorous species, feeding on fruits, nuts and seeds. It is an opportunist, though, and also takes insects, zooplankton and small fish. In the aquarium offer it a varied diet consisting of quality dried pellets or floating sticks, along with plenty of fruit and vegetables. Spinach, lettuce leaves, and fruit and vegetables such as apple, banana, peach, grapes, courgette, peas, cabbage and carrot all work well. Small fish will likely be eaten but in general it’s quite peaceful with bigger species. It can bother sedentary or shy companions with its constant activity, though. Obviously a truly enormous tank is needed to incorporate it into a community. If this kind of space is available suitable tankmates include Arowana, other similarly-sized characins, big cichlids, and large catfish from the Pimelodid, Doradid and Loricariid groups. It’s a shoaling species when juvenile, becoming more solitary as it matures. It can be kept in a group in the aquarium, but again, this is largely dependant on the amount of space available. In smaller quarters adults can become a bit of a nuisance, chasing and nipping the fins of both its own kind and other species. 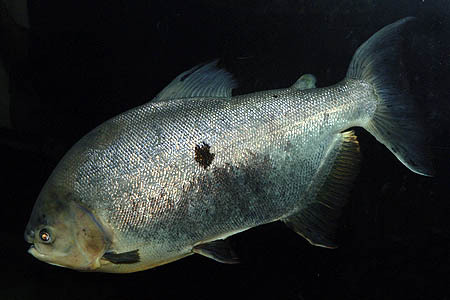 Mature females are a little rounder-bellied than males. Not achieved in the hobby, although it’s being bred in some numbers for food in both South America and various Far Eastern countries. The fish are often induced to spawn via the use of hormones. Know as the pirapitinga in its native countries, this is the one of the largest species of scaled fish found in the Amazon basin. This alone should tell you much of what you need to know about its suitability as an aquarium inhabitant. In reality it’s debatable as to whether the species should be considered an aquarium subject at all. 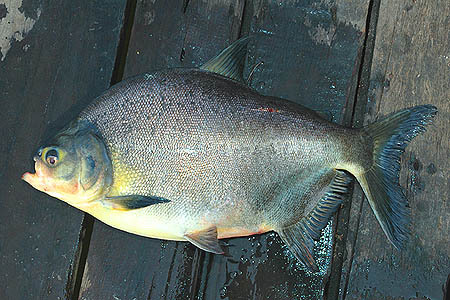 While pacu rarely reach their maximum size in captivity, they’re still easily capable of growing to a couple of feet in length. The myth that fish will only grow to match the size of the tank they’re kept in is just that – a myth. Unfortunately it’s regularly offered for sale as a cute 2-3″ fish, often labeled with enticing names such as “vegetarian piranha” or even “red-bellied piranha” (pacu are included in the same subfamily as piranha and resemble them superficially). 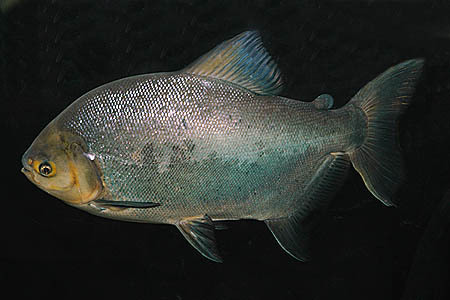 Juveniles of P. brachypomus are in fact patterned to mimic the real red-bellied piranha, Pygocentrus nattereri as a deterrent to potential predators. As a result many public aquaria have large displays of adult specimens that have been “donated” by fishkeepers, often to the extent where they refuse to accept any more. A more depressing, but equally common scenario is that the fish are dumped into rivers and ponds when they outgrow their tank. In colder climates they will obviously not survive, but populations exist in various states of the USA and several other countries as a result of releases by irresponsible aquarists. The species has subsequently been banned from sale by many wildlife authorities in the US. 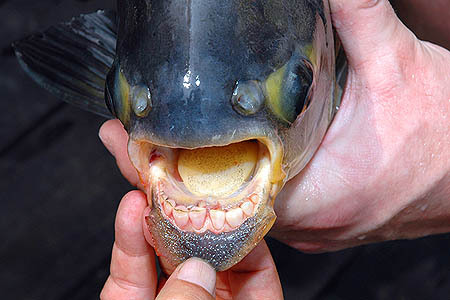 Pacu have developed amazing dentition to allow them to crush fruit, nuts and seeds. Their teeth are cusped and resemble human molars, and they also have very powerful jaws. Although they are rarely aggressive they can inflict a really nasty bite, so take care when performing tank maintenance. The species is widely used in aquaculture projects in South America. It’s ideally suited for the purpose, being tolerant of a wide range of water chemistry and possessing the ability to survive in oxygen-depleted conditions. Much research is being undertaken to find the most ecologically sound way of farming it, as it’s suffering from gross overfishing in many of its native waters. If wild stocks become further depleted, there could be serious implications not only for the species itself, but also entire ecosystems. The seeds of many of the fruits eaten by pacu are indigestible, and are excreted intact. Some experts believe the fish play a significant role in seed dispersal of plants from areas of flooded forest. Sustainable commercial farming of pacu is therefore considered a priority. Not only will this prevent further depletion of wild stocks, but it will provide an alternative source of income for farmers. The hope is that it may also encourage them to take up aquaculture instead of agriculture, which is having a devastating effect on many parts of the Amazon rainforest. As a food fish pacu is apparently very tasty. Its natural diet of fruit and nuts is said to enhance the flavour of the flesh. As the fish is so large cuts are often sold on the bone in a similar way to pork ribs. One further commercial use of the species is as a sport fish, both in its natural environment and artificially-stocked lakes. It’s been introduced into several Far Eastern countries for this purpose, including Thailand and Malaysia.